Dont be afraid, I sell no blue pills. Not everybody speaks english there, but I am Luxembourgish and would be pleased to answer you if you need help. one of the biggest in Europe. But "Mills" saved me, so I am here. Hi! 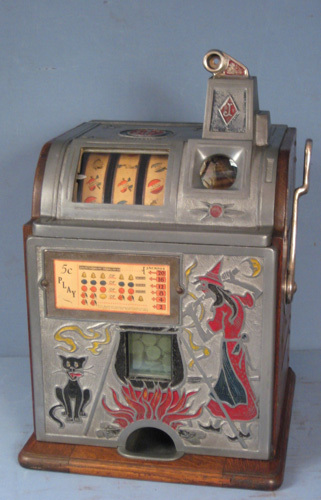 I have an German Slot machine, that i am interested in selling.. It's a Rotomat Ariston - 1973. It that has been in our family for a long time. I remember it working when I was young, however it was stored in an our outside storage building for several years and no longer works. The outside cabinet is in pretty good shape. Is this a slot machine that you would be interested in or do you know of someone who may be? I have German coins that go with this machine. We live in North Carolina. I could really use some help on determining a value on this. Any ideas on who or where I should start? Any help you can offer would be appreciated. Your machine was made by Gunter Wulff Gmbh, in 1968, the company was bought by Bally in 1972, in 1960 the company assembled all of the Sega Bell machines for Marty Bromley to operate in the U.S. military clubs in Europe. I have attached various pictures of the company, including one of my late fathers stand at the 1960 London Trade Show, the lady in the picture is my late mother, also pictures of the Sega Bell that was assembled in Germany, in my autobiography I have more than 20 pages relating to the company, Hans Kloss a past president of Gunter Wulff became president of Bally Gaming in Las Vegas in the early 1990's, he is a friend of mine since the early 1980's when Bally produced one of my machines under license in the Gunter Wulff factory in Berlin. Your machine is a fine piece of engineering, but operates on an high voltage, so be careful, sorry to tell you it is not a very collectible piece, but if you google Gunter Wulff on the internet, I am sure you will find a web site for German collectors, I would just keep it for a decorative item, no value here in the U.S.
Good information to have... thanks for the reply! Hello grayone, Welcome to the forum. I agree with Freddy , in the U.S. very little interest in these. I personally know nothing much about them but, just looking at it, looks like it might take some instructions on how to play (might not). even on newer slots , it's not much fun if you don't know why you just lost or won money. locally (Phonenix, Az. )there is one identical to this up for sale, just under $300.00. was listed & relisted many times.... for a long time. might just need a nice cleaning inside to get it started up again. finding proper coins for it should not be to difficult. same size, ect. for many years. thank you for showing us ! maybe this will help spur more interest in these types of gaming machines. What can you tell me about this machine and it's maker?